Have you got confidence in your guttering system…………will it keep water out of your residential or commercial property each and every year, do you have a regular maintenance plan or schedule. We use Traditional Gutter Clearing by Hand and Space vac Technology and for higher building work above 14 metres (approx 4 stories) we use cherry picker platform – we work to the smallest detail to completely remove the build up of moss, mud, silt, old pointing (concrete), tennis balls, weeds, dead birds, blocking the down pipes and preventing your guttering from working efficiently………………..
Home or Business Owner/Facilities Manager ……ring us today to book an appointment…………we will come out to see you and give you a free quote……………. We work with Housing Associations, Facility Management Groups, Landlords, Engineering Factories and Home Owners to ensure your Gutters are cleared out and work efficiently throughout the year ..and every year..
Commercial Companies place their employees at risk every year by using either their own untrained/unqualified/uninsured staff to clear gutters or use outside non-professionals placing their Company at risk of heavy fines and ignoring Health & Safety Policies. Not to mention the danger of injury or death. 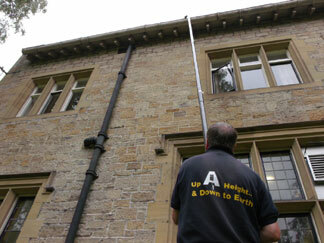 Up A Height provide a gutter cleaning service in Newcastle, Gateshead, Sunderland, Durham, Blyth, Morpeth, Houghton le Spring, Chester le Street, Ashington and Seaham areas.